First experience and it was great experience. Setup was too good, person was understandable, did d massage in great way ...in short it's perfect massager..
My son had it done. He liked it very much! Excellent hands and very relaxing massage. The masseur is very well trained and is very good with his skills and uses the right kind of pressure within a few minutes of starting the session after understanding ur comfort level. I had a very good experience with Mr. Javed. He knows what he is doing and provides really good service. Jignesh is very knowledgeable in massage therapy. I'm fully satisfied with his work. My first experience. And it was relaxing. He was a complete professional. Mahesh was train professional. Very polite and co operative. Perfectly done his job. Feel relaxed during massage. Restored energy feeling very energetic. Thanks to UC for best service. I had booked it for my husband. 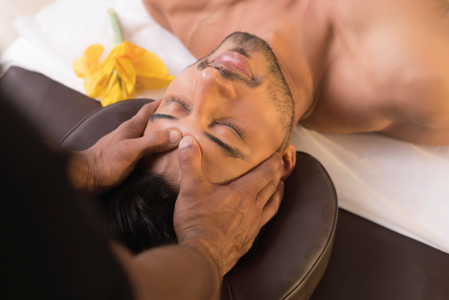 He expressed that this massage was one of the best massage. Mr.Vijay was professional and knew his work. We are happy with the oil, bed and music used during massage. We missed the candles. Overall it was very good.. Thanks Dear Shekh Its really relaxing & stress reliefing. Nice servise by ILYAS. I always recommend him.. It was amazing experience..very experienced guy.. Very good service, trained therapist equipped with all necessary equipment, bed, music, aroma.